This week we have received a charming accession which will be added to our Edinburgh Foot Clinic and School of Chiropody collection. 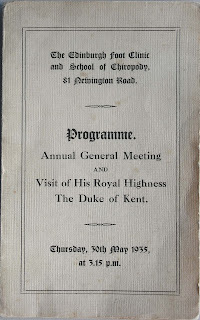 It consists of the programme for the Clinic’s AGM and the visit of HRH, the Duke of Kent on 30th May 1935. 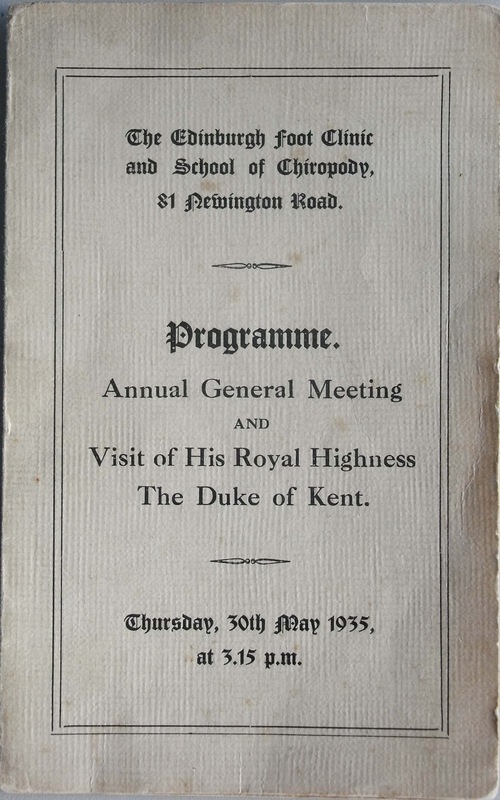 Enclosed with the programme, which measures approximately 9cm by 5cm, was a photograph of the Duke meeting nurses at the clinic. ﻿﻿﻿﻿﻿﻿﻿﻿﻿﻿﻿﻿﻿﻿﻿﻿﻿﻿﻿﻿﻿﻿The Edinburgh Foot Clinic was opened in 1924 by Miss Catherine Norrie and her sister Mrs Margaret Swanson to treat ‘minor foot ailments of the working class’. Situated at 1a Hill Place, it was open for two or three half days each week and was staffed by volunteers. Patients paid a minimum charge of 1/- and, if possible, an extra donation. In 1928 the Clinic moved to 81 Newington Road, due to increased demand for its services and the consequent need for larger premises. During World War II mobile chiropody units were set up for the Services. By 1948 the Clinic was open on all week days and on Wednesday evenings. It still catered mainly for working class patients. Most applied for treatment directly to the Clinic, although some were referred by their GPs. The National Health Service took over the running of the Clinic in 1948. You can view the full catalogue on our website: Edinburgh Foot Clinic Catalogue. Yesterday I gave a presentation as part of the RLUK/PAC training day: writing and using a preservation policy. LHSA’s experiences of producing and implementing a policy of this kind were shared with 16 delegates from organisations near and far, from St Andrews to Stockholm! The event was hosted by the National Library of Scotland and most of the day was given over to showing the delegates what should be in a preservation policy and how to go about writing one. I was last up with a short, informal presentation using LHSA as a case study. We finalised our policy in 2007 (a summary version is available on the LHSA website), and it has been the foundation for all our preservation and conservation work on the collections since. I talked about why LHSA felt a policy of this kind was important (to formalise our responsibility for the care and use of the collections) and what the aims of the policy are (to outline LHSA’s approach to the care of the collections, both present and future, and to detail current conditions and conservation work). I also described how it had been used to underpin our conservation programme and as part of the induction process for new staff. The policy has also been used as supporting evidence for applications to external funding bodies and in my own professional accreditation. I finished up the talk with some thoughts about what we might do with and to the policy in future and gave the delegates some top tips! The training day was a great opportunity to meet other professionals and share some of LHSA’s experience in this important area for the preservation of our cultural heritage. LHSA contains many records relating to the First and Second World Wars. 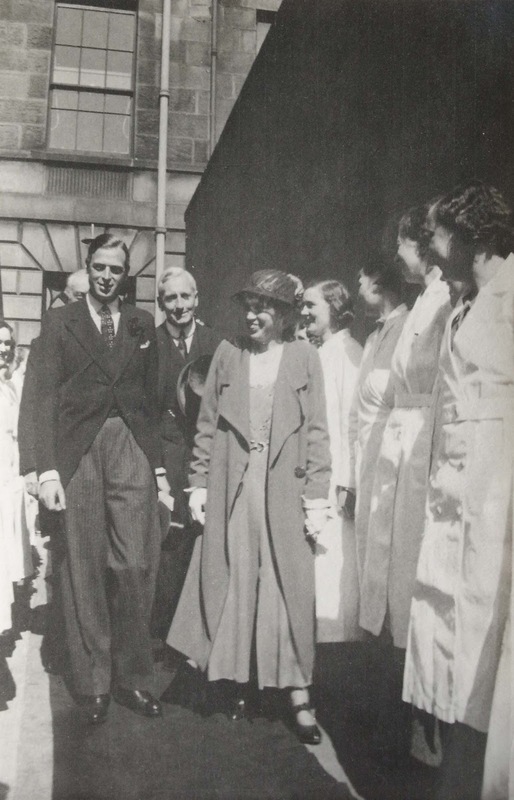 A number of Edinburgh’s medical practitioners worked in military hospitals and many injured soldiers were treated in Edinburgh on their return from battle. The hospitals treated soldiers from many of the allied nations, as well as prisoners of war. A full list of LHSA’s First and Second World War records can be found on our website: The Two World Wars Source List. We have selected two items from the collection to show on Armistice Day. The Leith Roll of Honour (our ref: LHB6/38/1-5) is a list of over 2,200 people from Leith who died during the First World War. As part of his research into the graves and memorials of those named on the Roll of Honour, a private researcher, Andrew Grant, compiled an anthology of Great War poetry selected from the Leith Observer. A copy of the anthology is available to view in the Archive. This poem is by the Leith writer JB Symons who worked under the pseudonym, ‘Restalrig’. Has found a hero’s grave. An’ helped tae lay him low. A’ ither fechts maun blind. Proved warriors brave and liege. As they show deeds that thrill. An’ join the gallant crew. To gain the famed V.C. That ever yet cam’ near it. An’ ance mair upward spiel. LHSA also contains a number of editions of the Craigleith Chronicle (our ref: GD1/82). This First World War magazine from the Second Scottish General Hospital, Craigleith, contains stories, poetry and drawings produced by the patients while recovering from their injuries. The pictured article from Vol.1 no. 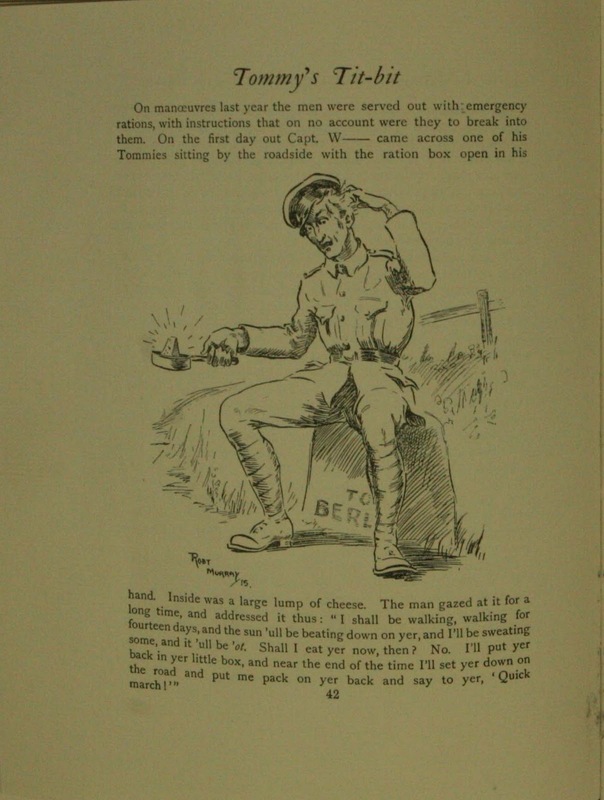 3 tells of a soldier opening his emergency rations and pondering the possibility of his piece of cheese carrying his packs for him! 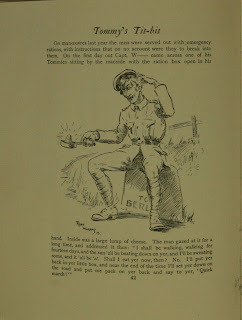 This highlights the hardships faced by the soldiers and their means of coping with them using humour. The Craigleith Chronicles are progressively being digitised and put on the LHSA website (take a look at Vol 1. no.2 ). This week, as part of our regular outreach work, Laura gave a talk to Corstorphine Women’s Guild, focusing on the role of women at the Royal Infirmary of Edinburgh (RIE) in the period 1870-1950. This was a time which saw huge changes in medicine, and with the opening of the then brand new building at Lauriston Place in 1879, the Hospital was at the forefront of healthcare in Edinburgh. 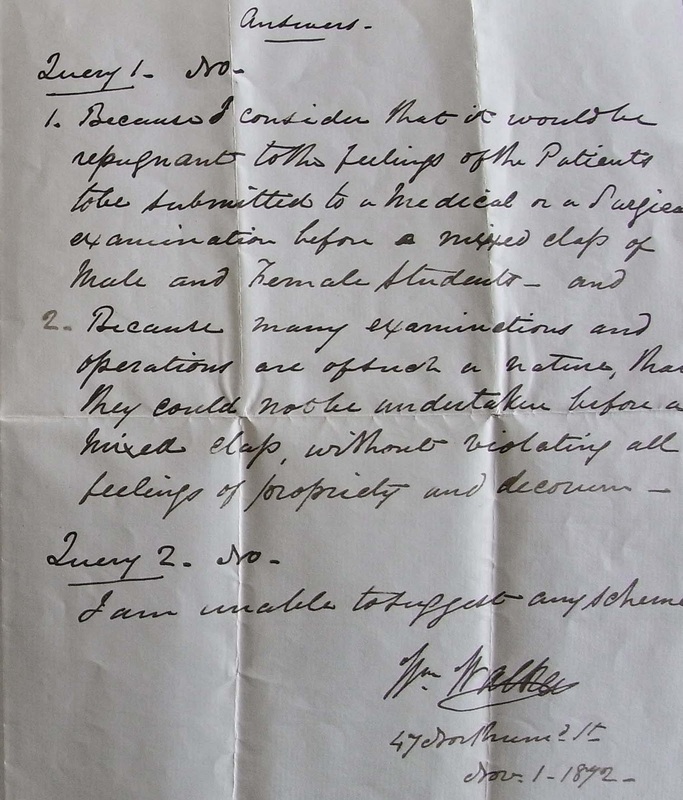 At this time, not one, but two revolutions were underway for women associated with the Infirmary: radical changes to nursing and the challenge for women to receive medical training. Florence Nightingale’s Training School for Nurses at St Thomas’ Hospital in London was opened in 1860. It was a step which introduced a greater degree of professionalism to nursing, turning it into a career for educated women. There was a movement to formalise procedures and create high standards for all nurses to attain. Taking note of these changes, the managers of the RIE instituted a probationary period of training and a higher wage to attract “a better class of woman” to the profession. A Lady Superintendent of Nurses, Elizabeth Barclay, was appointed in 1872, and the RIE Nurse Training School was founded in the same year. The School gained an excellent training reputation, and RIE-trained nurses went on to take up positions the world over. 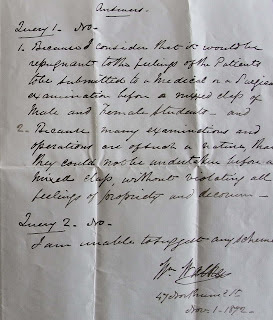 ﻿Despite this, in December 1872, the Board passed a motion to allow female matriculated students of the University to receive clinical instruction but at a separate hour to the male students and only in certain wards. However, they were not permitted to view post-mortems, to see major surgical operations nor to act as clerks and dressers. Not to be deterred, an increasing number of women went on to gain medical degrees.